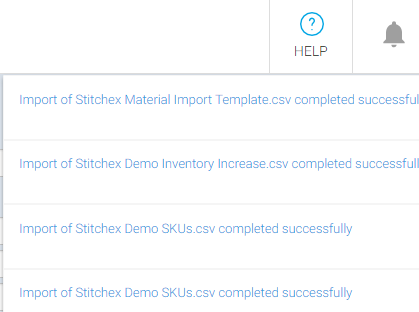 Every combination of product, variation and size has a unique inventory level in Stitchex. As you ship products to your customers and receive products from your manufacturers, inventory levels are updated accordingly and you should always have an accurate measure of your current inventory available to you via the reporting interface. Stitchex also tracks the production quantities required to cover your sales, as well as quantities awaiting delivery from your manufacturers. These quantities are available as reports as well. Set inventory levels directly from a product details page. Creating a manual inventory adjustment. Exporting/importing a spreadsheet of inventory levels. Navigate to the product details page for the product you want to receive. Click the SKUs tab at the top of the page. For each SKU, enter a stock count into the fields below "In Stock". Click the "Update Product" button. Select Inventory Adjustments from your left, vertical main menu. In the Inventory Adjustments area, click the drop-down button on the top right and select "New manual adjustment". A new inventory adjustment record will be created and the 'Select Products' dialog will open automatically. Select some products to add to the adjustment. You can always add more products later. Click the "Add Products" button. Enter the inventory adjustments quantities. Enter positive values to increase the inventory level, negative values to reduce an inventory level. Click the button to optionally add a comment explaining the reason for the adjustment. When you are ready to apply your adjustments, click the "Apply →" button. You will have the change to undo your change if a mistake was made. You'll notice that draft/unapplied adjustments are listed at top, above the grey arrow. As you apply the adjustments, they are transferred down to the list of applied adjustments. The green quantity values indicate quantities added to inventory, and the red values indicate quantities deducted. Navigate to a particular adjustment by clicking it within the adjustment list. The "Filter by product" input box can be used to search for adjustments that contain a particular product. You can enter a product name or product identifier in this box. Click the button to perform the search. In a typical stock-take scenario (where you wish to record and enter total quantities counted), it's likely that you'll want to use the import spreadsheet method of updating inventory levels. Select SKUs from your left, vertical main menu. Scroll down to the bottom of the screen and click "SKU CSV" or "Excel" (See Figure 1) to download a list of your existing inventory and/or a blank template for uploading. Update your CSV or Excel file with your new total inventory count in the "in stock" column and save. Click the drop down arrow next to Upload Data at the top right corner of your screen as shown in Figure 2 and select Upload Stock Levels. Select Browse for File and locate your file, then click OK (Figure 3). These are the columns within your spreadsheet that you can update. In an attempt to import stock levels by SKUs, this error report was generated. As you can see from the example below, some two items in the spreadsheet "failed" and one item "completed with some errors". After further examination, the "failed" items were corrected by removing the line items with "zeros". And, the row that completed with some errors was because some of the SKUs were not in the system. Recheck your import file and system. Then, try the import again. You will also receive an email message from support@stitchex.com letting you know if the import was successful. You can view transaction changes in your Inventory Change Log by selecting "Change Log" at the top center of your screen. When you want to go back to inventory adjustments, click the Update Inventory button in the top center of your screen. A Bundled Product can consist of multiple products, variations and sizes. When a manual inventory adjustment is performed against a Bundled Product, the increase/decrease of the "In Stock" levels are performed on the individual products within that Bundle. For a Bundled Product composed of two caps and an Inventory Adjustments is made to the Bundled Product with an increase in quantity of five, the SKU of the individual caps will be increased by a total of ten (five for each cap within that bundle). See our Knowledge Article on Bundled Products for additional information.